For those flute students who've been playing three years or less, or are starting private lessons for the first time this year, you may want some really fun music to play. 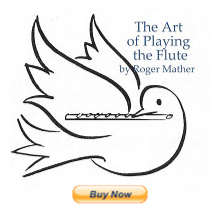 Matthew Taylor has uploaded FREE flute sheetmusic with groovy mp3 backing tracks. There's a Japanese sounding piece called Flooshie (very cool! ), there are a bunch of very easy beginner pieces, good for warming up, and there are even 30 simple rounds for getting together with friends and playing in a duo or trio. Please check them out, download and print the sheetmusic (pdf) and burn the backing tracks to a CD for your own fun practising. Slower speed mp3s for those who need to build up their speed are also available at the same site.